Central Avenue Viaduct connects James Street – one of the main arteries of the West Bottoms – to Kansas City, Kansas. This area was once an intersection of the streetcar and the freight lines. This streetcar stop was one of the major lines to and from KCK and traveled along the underside of this bridge. The freight lines facilitated the transportation of goods to various industries in the area. The area inside the bend of the Central Avenue Viaduct was once home to railcar storage that serviced meatpacking, agricultural, and other related industries. Today, the rails have been removed and the lot paved, leaving what is now a relatively large yard of open public right-of-way. Parallel to the length of the yard is 1st Street; this road services milling and concrete facilities to the southwest. During the work day, concrete trucks pass back and forth in front of what was first Mauer-Neuer meatpacking, and then became Midwest Industrial Services, and is today vacant. Because of its neglect and erosion, this building is now a canvas for graffiti artists and an attraction for urban explorers who have named it “The Lab” due to its previous function as a waste management facility. Surrounding the backside of this building is a lot for the storage of shipping containers, operated by Double V.V. There are other light industrial uses to the south and north, some of whom use the yard for parking. The newest users come from Hickory Union Moto. After moving from Hickory Street in the Historic Core, this DIY motorcycle repair shop has chosen an old fire station for their new location on the outside of the viaduct off of James Street and Central Avenue in the Riverview District. Since their opening day in the spring of ‘17, they have created a considerable amount of social energy in an industrial atmosphere which fits their vibe as a motorcycle community. Nearby, this area is also host to a much different scene – a nightclub called The Wave. For more information on the analysis of the Central Avenue Viaduct site, please refer to the KCDC's project publication for the first phase of West Bottoms Reborn. Though Central Ave. Viaduct struggles with a public identity today, this design exploration hopes to create a platform for similar spaces in the West Bottoms to be designed in the future which provide a sense of community to the area. The concept of Creative Placekeeping as a design method addresses the need for minimum design intervention on the site in order to retain the unique experiential qualities of the site. The space’s contextual location makes it very interesting as it is located within the vicinity of industries, communities, and structures. At the same time, Central Ave. Viaduct is defined by elements such as sound, wind, light, and water that continuously evolve the space throughout the day. Water management becomes a design imperative for this site in order to curtail its dilapidating act on the site. Therefore, water management on the site will not only solve an infrastructural problem, but also harness the ability to make the site attractive, gravitating more community engagement. 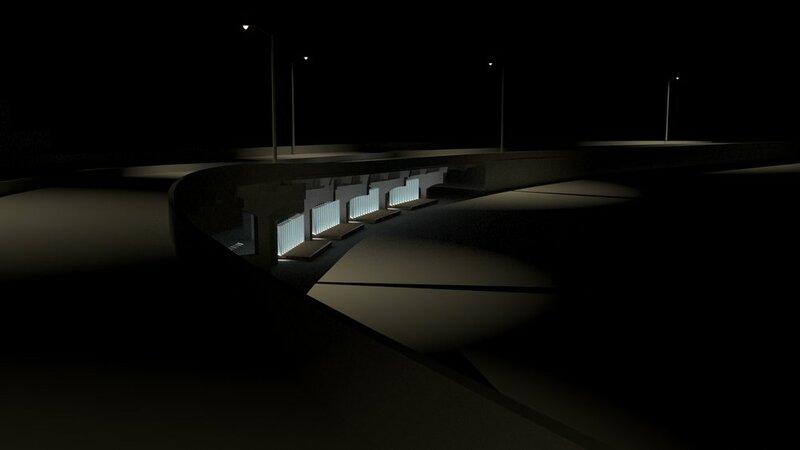 Light features can build on the site’s existing contrasting characteristics, defining two unique spaces in Central Ave. Viaduct. Design needs to maintain a balance between voicing the site with a sense of safety, as well as making the site alluring. The Central Ave. Viaduct houses great opportunities and potential for local businesses and industries to grow. Bringing nature to Central Ave. Viaduct can provide a ground for a pausing or relaxing moment from the otherwise fast-paced and chaotic nature of the industrial district in West Bottoms. This video features an experiment implemented to test the sun angles that infiltrate the space beneath the viaduct.